This got me to thinking about how big of a role music plays in my life. When we were getting ready to move, we had to get rid of things. I edited my bookshelves, and my closets. I got rid or furniture.... But I had to leave my piano behind, and I cried. 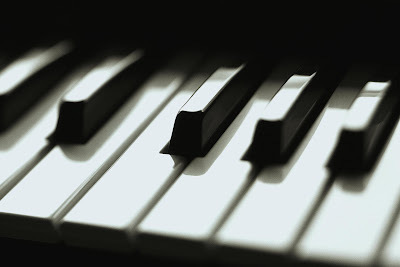 I cried because without a piano, my home feels empty. I used to sit at the piano and just play. I would play until I had worked out my feelings. I would play sad songs, and let the melancholy of the moment really sink in. Or I would play harsh notes in minor keys to work out my anger and sometimes, I'd be in mood for Broadway and would sing until my voice was hoarse and my fingers ached. When I was first married, we didn't have much. One night, I got a phone call from my mom saying that my aunt was getting rid of her piano. Dadguy and I left the next morning to drive to California to pick it up, because I needed it. I played for my babies. I really believe in the power of music, and the effects it has on children. Naturally, when I discovered I was pregnant, I would serenade those babes. And when they were born, I would croon in their ears as I rocked them to sleep. Now that those babies are growing, the rocking is disappearing. I only get to rock them when they're sick. But those are my favorite moments, in the quiet early morning hours when it's just me and my baby, singing a soft lullably to calm down their precious soul. In our home, we would have "music time" every day. I would sit at the piano, and take requests. We would sing about baby whales, and peanut butter sandwiches, and itsy bitsy spiders... Sometimes we would dance to ragtime, or pretend to be ballet dancers on a big stage. We even had songs to help us use the toilet and brush our teeth. This is the first time in years that I haven't had music filling my every waking hour. And a part of me is mourning that. I really miss that part of me. I have so many thoughts swirling around in my head that I can't sleep at night. I've tried to write a few times, but it's just not the same. I need music in my life again. I need it to fill my home. I need to hear my children singing, to see their eyes light up when they touch the keys. I need it because it's who I am. I really need my piano back.